1. So what happened here, exactly? Tammy is a passion project for Melissa McCarthy—she co-wrote the film with her husband, Ben Falcone, who also directed and has a small role as a fast-food manager—and she spent nearly a decade trying to make it. So why is it so, so terrible? This is the movie McCarthy was fighting for? Her considerable talents—not just the loud hilarity of Bridesmaids, but her quieter, razor-sharp wit in films like the underrated The Nines—have often been wasted on junk since Bridesmaids made her a star, which is probably why she and Falcone decided to take a little more control here. But they have made things so much worse. This movie, inexplicably, is a total disaster. 2. Within the first five minutes of meeting McCarthy's Tammy, we see her fired from her job, kicked out of the house by her husband (who mostly just looks scared of and sad for her), and berated by her well-meaning-but-just-over-it mother (Allison Janney). Falcon and McCarthy seem to think this will help us empathize with the character, but what it's really doing is making us want to run as far away from her as possible. I'm sorry, but Tammy is awful. She's obnoxious, she's stupid (she doesn't know who Mark Twain is), and she's cruel to everyone in her path. (There isn't a single person whose life she doesn't make more difficult.) She is truly insufferable, and not even McCarthy's inherent likability can salvage her. The movie desperately wants us to think she's charming, that she's just trying to get it together, but you can see the seams showing: The supporting characters deliver most of their lines through teeth-gritting grins. 3. The plot, such as it is, basically constitutes a road movie featuring Tammy and her alcoholic grandmother, played by Susan Sarandon in a big performance desperately in search of a character. The two don't spend much time on the road, though: Despite the fact that the goal is to visit Niagara Falls, and the two live in Illinois, they get sidetracked in Louisville, which is not how geography works. Granny is an incorrigible drunk, which the movie pretends to take seriously, but mostly uses as an excuse to force Sarandon to do Betty White's schtick. The two just sort of shamble about, occasionally getting arrested, before they end up, for no real reason, at some sort of lesbian compound, where all sorts of talented female actresses are required to act stupider than they really are. This is all to say that the movie never actually goes anywhere. 4. You'd have sympathy for McCarthy if she weren't the architect of her own implosion here. 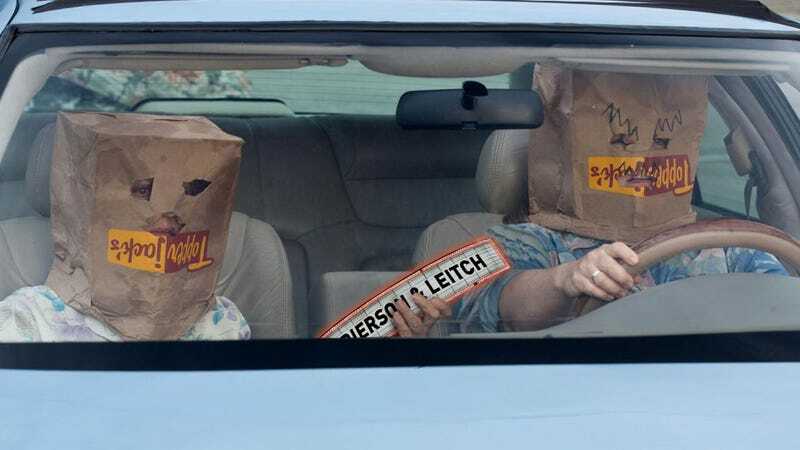 Tammy probably should be a slight, gentle indie comedy about a small-town woman trying to get her life together, but because it's Melissa McCarthy in a big summer comedy produced by Will Ferrell and Adam McKay, she has to ham it up at every opportunity. So she tap-dances as fast as she can, attempting to wring jokes that just aren't there. The movie's comedy has the distinct, uncomfortable feel of flailing improv, watching people stuck in unfunny situations with nothing funny to say, doing everything in their power to yank something out of this. The film is both slack and frantic; it shambles around until, in a panic, it sprints face-first into a wall. 5. McCarthy is a massive talent, and she can turn even middling entertainments like The Heat into something tolerable. (Her director on that film and Bridesmaids, Paul Feig, has taken her up as his muse; their next film together, Spy, with Jason Statham and Rose Bryne, seems promising.) But as with any comedian, you can't just toss her onscreen and expect that to be enough. Tammy is poorly conceived and poorly constructed from the outset. (Falcone is an aggressively lousy director: The movie has no pace or rhythm whatsoever.) This is barely a movie at all: It is a movie-related substance. As a fan, I still find myself excited to see what McCarthy will come up with next. But if this—this—was really her passion project, it's time to be seriously concerned.